Musicians Dilon Djinji and Antonio Marcos survive playing and singing their sorrows and happy memories. 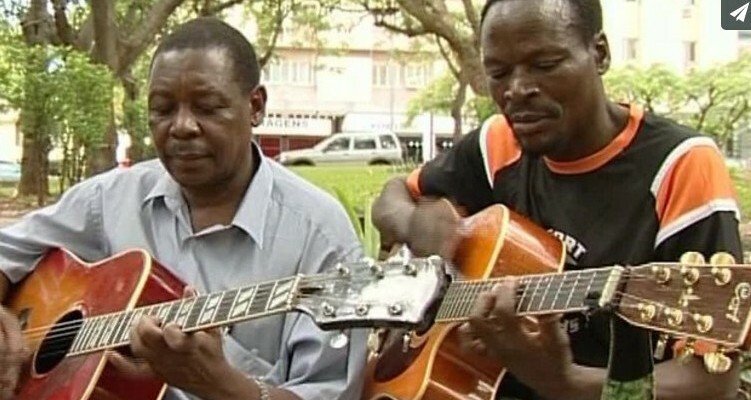 Young Mozambican musicians who play Jazz, Funky and Hip Hop join a group of elders who play Marrabenta, a musical style typical of Mozambique in the 1950's and 60's. This unexpected combination of different types of music works extraordinarily well, as we will see during their South African tour. This trip evokes the origins of each of the musicians. Boswell maps out Mozambique and shows the confluence of two generations, one that has experienced the oppression of the Portuguese, but both of which continue to suffer in the aftermath with music and culture as a mechanism of self-preservation. Pinther, Kerstin, Larissa Förster, and Christian Hanussek. Afropolis: City Media Art. Auckland Park: Jacana, 2012. Print. Azevedo, Licínio. The Train of Salt and Sugar. Johannesburg, South Africa: 30° South, 2007. Print. Ginger Roots, BBC “Focus on Africa Magazine.” African Studies Companion Online (n.d.): n. pag. Print.